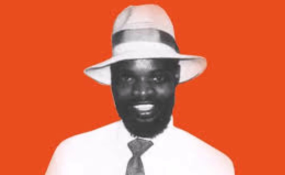 Legendary musician Leonard Dembo's son Tendai sacrificed his education in order to "protect" his father's legacy, Dendera musician Sulumani Chimbetu has revealed. Chimbetu, who is also the heir apparent to the Dendera throne, revealed this at the launch of Tendai's six-track album titled Dzinde at Eastpoint (formerly Jazz 105) in Harare on Friday. The legendary musician, born Kwangwari Gwaindepi, died at the age of 37 in 1996, when Tendai was eight years old. In 2007, Tendai and his brother Morgan threw themselves into the fray, thanks to sungura musician Alick Macheso, who took them through apprenticeship, and took over the Barura Express. Six years down the line, Tendai has slowly fitted well into his late father's shoes, which has endeared him with Barura music fans, who have "anointed" him successor to the throne. "I have known Tendai and Morgan for some time. Tendai was more of an academic person, but he had to shelve plans of going to university in order to pursue a career in music and protect his father legacy," Sulumani said. "I am happy that he has come of age and is doing well on the music side, keeping his father's legacy alive. I am also told that he is now doing his studies, balancing with music." Tendai gave a scintillating performance that enchanted music enthusiasts, including promoter Partson "Chipaz" Chimbodza, who expressed his desire to "readopt" the youthful musician. "I once worked with Tendai some years back, but I have a noticed a great improvement in the young man, especially his voice. He is doing very well and we can do something and work together again," said Chipaz. Three years ago, Chipaz gave Tendai and his Barura Express a slot to perform every Thursday at his Dandaro Bar at the Harare Exhibition Park (Showgrounds), but the deal later collapsed due to contractual disagreements. Tendai said he was happy that his performance had charmed his erstwhile "father" Chipaz. "I am happy that Mudhara Chipaz is here to support me and he has shown his desire to work with me again. I would like to thank all those that have supported me in the production of this album as well as those that have made this event a success," Tendai said. "My father died on April 9 and releasing this album is a way of saying thank you to the man the family regarded as a fountain of advice." Tendai performed several hits done by his father, mixing his playlist with songs from his three albums Kupakwashe, Mushando and Dzinde. Songs on the new album, which was produced by veterans Jabulani Ndlovu and Bothwell Nyamhondera, include Sori Dhiya Wangu, Chemedzai, Rufu, Changu, Asi Chiiko Nhai? and Mupi Wemazano. Barura Express benefactor Johannes Marisa vowed to support Tendai and keeping the Dembo legacy alive. "I grew up listening to Leonard Dembo's music that when he died in 1996, I couldn't eat food for three days. I am happy that Tendai has taken over and is keeping his father's legacy alive," Marisa said. "I will keep on supporting him. I will help him achieve his goals, which include keeping his father's legacy alive." Marisa said he would make sure that Dembo was well-equipped to release good music. "We are doing everything so that he gets the support he wants to come up with good music and this new album is testimony of the good work that Tendai and Barura Express are doing," he said. Marisa, who three years ago donated a car -- a Mercedes-Benz ML -- to Dembo, vowed to maintain his association with Barura Express. Management at Eastpoint gave Tendai and Barura Express a slot to perform at the joint every Saturday. Afro-fusion musician Moyondizvo, Smoko Music outfit Chazezesa Challengers and Potipher Mopo were supporting acts.